Halloween is just around the corner! I went digging to find some fun Halloween kid crafts for the boys to make. Since I was digging, I decided I would share the fun Halloween crafts I found. Handprint Bat Craft – A fun craft using handprints to create a flying bat! Make a Paper Plate Spiderweb – Only a few supplies are needed for this craft! Super Easy Halloween Clings – This will keep the kids busy for hours! Flying Black Bats – A great way to recycle those egg cartons. Duck Tape Pumpkin – If your child isn’t into carving a pumpkin, try duck taping it with this tutorial. Soup Can Pumpkins – I remember making something similar to this when I was younger. Halloween Printable Coloring Pages – These pages are SUPER cute! Tin Can Ghost Wind Chime – Would make a cute outdoor decoration. Spider Craft – Kids can make these spiders in about 5 minutes. Toilet Paper Pumpkin – Start saving you toilet paper rolls! These are easy and super cute. DIY Mummy Candy Bars – Do your kids have Halloween parties? These would be an easy way to dress up the candy and get the kids involved in process. Beaded Pumpkin Craft – This is great to work on motor skills. Kid-Made Pumpkin Decor – Great way to recycle your newspapers and kids always love working with paint. For younger kids, you could get out the finger paints. Cardboard Tube Ghoul Family – Have your kids make their own family of Ghouls. Popsicle Stick Frankenstein – Easy to make and kids can make him look anyway they want. Paper Plate Ghosts – Easy way kids can make hanging ghosts for decoration. Candy Corn Footprints – This would be a cute idea to keep as memories on how big they were when they made their footprints. Paper Plate Spiders – These are the fun type of spiders that you want taking your house over. Handprint Witch Craft – Another great craft to save as a keepsake. Halloween Rock Magnets – Spruce up some rocks for cute little magnets. Toilet Roll Cats – These are real simple and turned out super cute. Halloween Lacing Craft – This is a great craft for motor skills. Popsicle Pumpkins – Get the out the glue and paints, kids will love making these pumpkins. DIY Monster Pencils – Great idea for kids in school. They can hand them out at parties if food is not allowed. Build A Monster Free Printable – Let them create their own monsters with this fun printable. Candy Corn Craft for Preschoolers – This is a fun way for preschoolers to learn gluing skills. Pine Cone Spiders – A fun way to incorporate nature into a Halloween craft. Fingerprint Bat Silhouette Craft – Kids love to get their hands dirty so this is perfect. Easy Halloween Popsicle Puppets – Make some puppets for playtime! Puffy Ghosts – Fun craft with cotton balls. Paper Pumpkins – These would be fun to decorate place around your house for decoration. Pumpkin Toilet Paper Roll Lantern Craft – These would be cute strung up and hung on a doorway. Popsicle Haunted House – Great way to get creative and make their own haunted house. Tattle Monster – Spruce up those tissue boxes and make little monsters. Sock Black Cat – An adult may have to help a little one with this craft, but it is super cute! There you have it – Over 35 Halloween Kid Crafts all in one place. I hope you found something you and your kids can work on. Happy Halloween! Check out these 20 Spooky Halloween Treats! This is such a useful list! Great ideas. I think is absolutely darling! I am going to have to try one of these just for me to have fun with! Thank you for linking up with us at the Tips and Tricks Link Party! I hope to see you back this week! 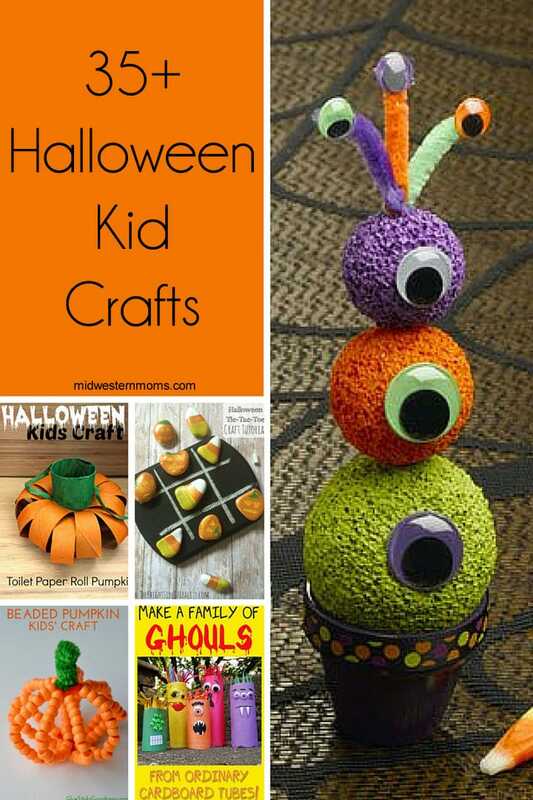 What a fun collection of Halloween crafts for kids. Thanks for including my DIY Mummy Candy Bars. Thanks for including our Paper Plate Spiderweb craft! I pinned, stumbled and tweeted the post!